Financial goals setting is one of the basic steps in preparing a financial plan. It answers the basic question, "Where do you want to be?" This is an translation of your desires and aspirations in life. Your desires and aspirations would not become financial goals if you do not attach a cost to them. This is basic to financial goals setting. I have observed that people have commonality of aspirations: These are the common aspirations of people I know: a nice home, good education for kids, a nice car, travel abroad, and a comfortable retirement, among many others. Surely, these things can’t be obtained overnight. You need to have a plan and to prepare your own financial plan to achieve them. A written own financial plan serve as your compass to get you from your where you are right now and where you want to be in a future time. It can be a year, five years, 20 years or beyond. A financial planner or financial advisor can help prepare a financial plan for you, but the substance and success of your financial plan wholly depends on you. It is therefore important to do your own due diligence. Increase your financial literacy to equip yourself become your own financial planner and financial advisor. Having clear financial goals is key ingredient to a doable financial plan. As emphasized a financial plan is important to one’s financial success regardless of your current financial state. Financial experts usually recommend to start financial planning by taking stock of what you have; that is assessing your current financial position. But for psychological reasons, I strongly recommend starting with what you want, not with what you have. Make a list or your goals and aspirations. Attach monetary values to the goals and aspirations in your list, at current prices. Indicate the timetable you wish to achieve them or specifically the number of years to wish to have them. Categorize your goals into levels of priority: essential, unessential but important, and nice to have.This is really up to you. 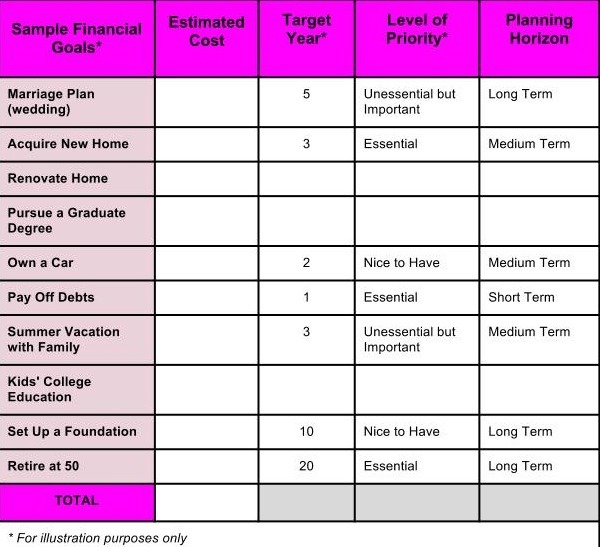 Prioritize the financial goals you have set by classifying them into planning horizon: short term (less than a year); medium term (1-3 years); and long term (over three years). A well-thought out financial plan is a very useful guide to get you from where you are now to where you want to be in the future. It’s similar to holding a road map while taking a journey from a point of origin to a specific destination. And it starts with clear financial goals setting. Good luck.